A veranda is the perfect addition to your home. 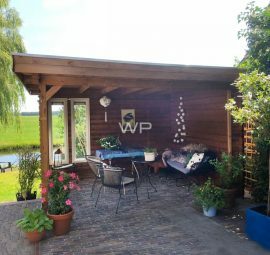 In a wooden veranda of Woodpro you can enjoy the sun, without having to worry about the (cold) wind. Are you already planning to change the look of your garden? Are you already discussing the appearance with garden designers? Or are you making a design by yourself? Then we suggest adding a premium quality veranda by Woodpro! Our verandas are sold via and extensive network of professional dealers. Because we have control about the complete production process, we can perfectly meet your individual wishes and requirements. 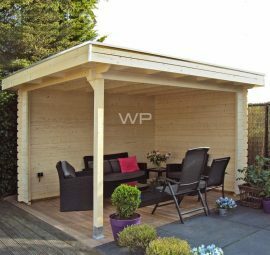 At Woodpro we offer countless types of verandas. We do everything to make sure you can build the veranda of your dreams in your garden! Do you love to sit outside in your garden? Then a veranda is the perfect place to sit down, relax and enjoy the sun during the summer. In the winter this structure can be the ideal place to dodge cold winds and rain, so you can even enjoy your garden during these colder seasons. You can even place a few heaters below your veranda, so the temperature is comfortable during all seasons. Before you consider building a veranda, you should make certain decisions about the design, location and type of wood used. Do you prefer a free standing veranda in your garden. Or should the veranda be attached to your house? An advantage of a free standing construction, is that you will have more building options. 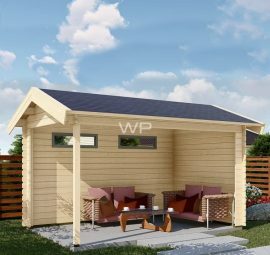 For example, you can choose to add an extra storing space right next to a free standing veranda of Woodpro. All our structures are made of premium quality wood from ice cold areas in North-Europe. This wood has the best possible quality thanks to its solid structure. Want to completely design your own veranda? Then a veranda by Woodpro is the perfect solution! With our 3D-configurator it is possible to design a veranda that meet all your requirements. Quickly try out our configurator for free. Our wooden verandas are easy to adjust to your own preferences. For instance, you can adjust the wall thickness. Or choose whether you want a column beneath the wooden pillars. Next, you can adjust the finishing touch of your veranda. Do you prefer wooden poles of 12×12 cm, or do you prefer square-shaped poles? You can also select different types of rood, such as a pyramid roof or a flat roof. On our pyramid roof you can select 5 different colors of shingles. In your wooden veranda it is optional to add more windows and/or entrance doors. We offer multiple options, so you can create a unique design. In our collection we offer single, double, slide and folding doors that you can add to your wooden veranda. 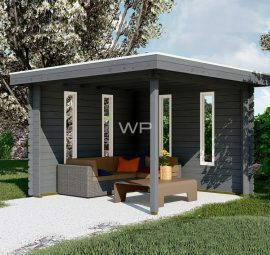 Finished the design of your personal veranda with our 3D-configurator? Then it is time to select what treatment options you wish for the wood. Woodpro offers to stain the wood or to spray all wooden elements. You can select wood stain in the color of your own preference. We currently offer 6 different colors of wood stain. Do you select that we should spray the wood to protect it? Then it is possible to spray it with a transparent substance. 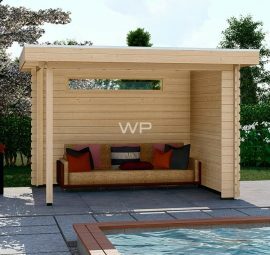 With this transparent wood spray you protect the veranda against mold. We always suggest using wood stain on our verandas to protect the structure against weather influences. The final option you can adjust in our 3D-configurator is the color of details such as locks and door handles. Or add several other options such as stairs, extra locks, different paint, or impregnated wood. Woodpro offers a wide range of verandas and the (extra) options are extensive. Simply check out our collection on your website to find the building of your dreams. It is easy to filter for certain options, such as size, color and shape. When you found the perfect veranda, you can consider whether you want to build the veranda by yourself. Or do you prefer to let the professional Woodpro team assemble the complete construction? 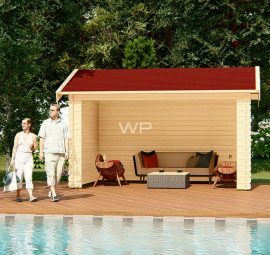 Everything is possible when you buy a high-quality veranda at Woodpro. Simply design your own veranda with our 3D-configurator. Or choose your favorite construction from our extensive collection. Need help finding the veranda of your dreams? Please contact us! Our dealers gladly help you finding the perfect veranda for your house and garden. Do you have any other questions, or do you want to know more about the advantages Woodpro has to offer? Contact us! We are always here to support you. 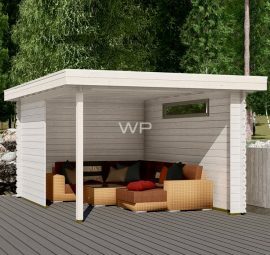 From a veranda, garage, carport or summer house: you will find them all at Woodpro! Our products are known for its premium quality and custom-made possibilities. Since 1978 we produce verandas from the best possible quality. And always against the best possible price. You will find our expertise in every veranda we build!